The pseudonymous manga creator ONE has experienced international success through two wildly different series: the satirical superhero sensation One-Punch Man, originally serialized online for free, then “remade” with artist Yusuke Murata for Weekly Shonen Jump to wild acclaim; and Mob Psycho 100, written and drawn by ONE, and now the basis for massively popular anime and live-action adaptations. While One-Punch Man has enjoyed stateside popularity for several years now under publisher Viz Media, Mob Psycho 100 received its first official English translation just last year from Dark Horse Comics, with the second volume scheduled for March 6, 2019. 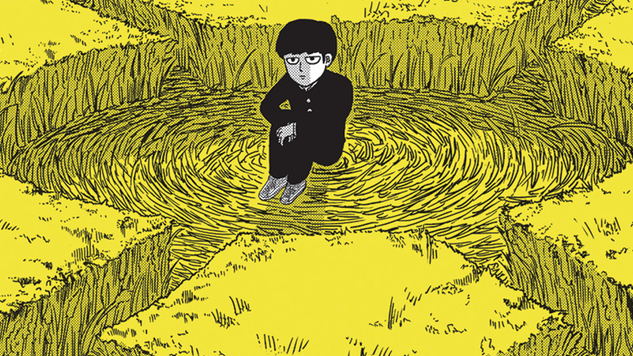 Shigeo is the titular Mob (a nickname given because he blends into the background, or “mob” of people), a teenage boy with vast psychic abilities, who must repress his emotions lest his powers run rampant. Shigeo works as a (severely underpaid) personal assistant to Reigen, a con-man who passes himself off as an elite exorcist with Shigeo’s help. Reigen exploits Shigeo while also mentoring the lad—and ensuring that his psychic energy level never reaches 100! Paste readers can check out an exclusive extended preview of Mob Psycho 100 Vol. 2 below, and nab it from comic shops and book retailers beginning March 6, 2019. A cult is starting to form… around Mob! While Mezato tries to dig up info on the shy but powerful psychic for the school paper, Mob gets tricked into an abduction plot designed to force the Body Building Club into a fight with the delinquents from their rival school. But when the other school’s “secret leader” Teru turns out to be a fellow superhuman, it’s going to be a massive but one-sided fight… because super or not, Mob refuses to use his ghost-busting powers against a fellow human!